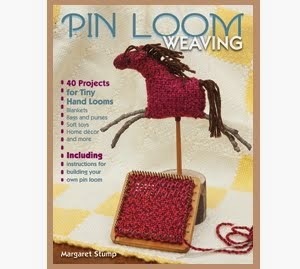 This is the first of a series of patterns and instructional material on using pin looms. The Weavies Mouse pattern has been around for a number of years. 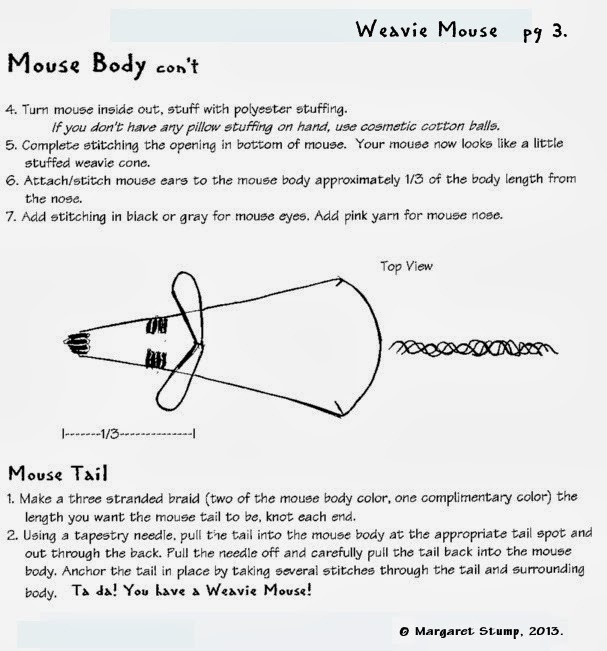 It has been a popular project, great for the quick creation of a stuffed mouse (catnip or stuffing filled) using one 4"x4" and two 2"x2" weavies. 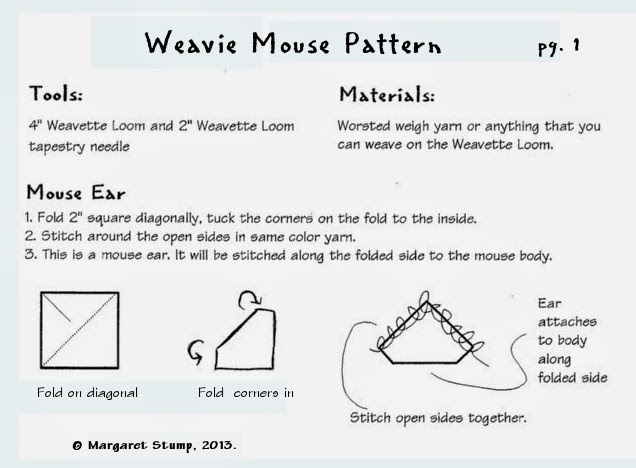 One note, the directions suggest using a Weavette loom. 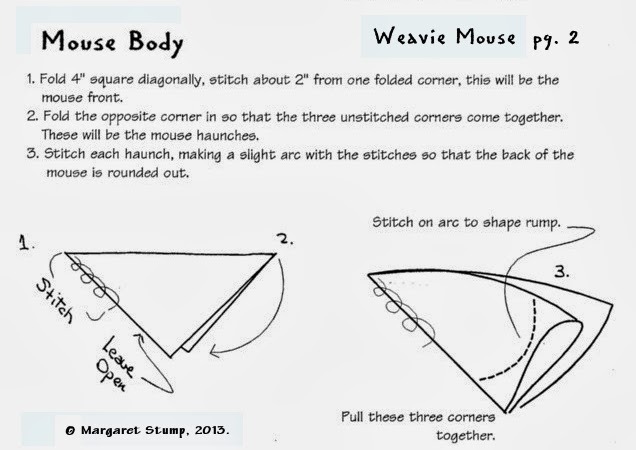 The directions were written shortly after the Weavette looms came out. Any of the 4"x4" and 2"x2" pin looms will work for this pattern. I end up talking with and reading about the works of people who, like me, really like small hand looms. 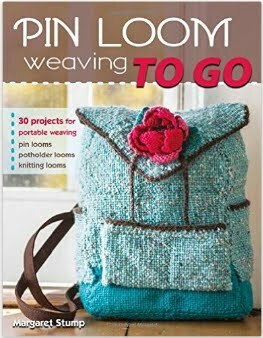 It is easy to forget that there are a lot of great looms out there and there are many ways to combine weaving styles. These are some examples from my blanket closet. 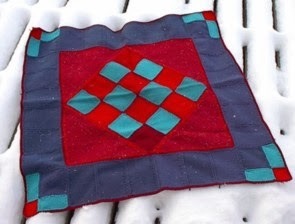 This blanket combines pin loom weavies with cloth strips woven on a rigid heddle loom. I like being able to make large swatches of a cloth to order, but the pin loom makes such a great product that I moved away from rigid heddle. <---- Another very old piece. The intention was to float the contrasting squares on the black strips made with an inkle type loom. The piece below combines several sizes of pin loom weavies with 12" triangles made with a Hazel Rose triloom. This is a great combination of looms because is allows you to move away from the constraint of grid patterns by building in a 90 degree rotation. Please let me hear about your favorite use of pin looms-- with or without the involvement of other looms. 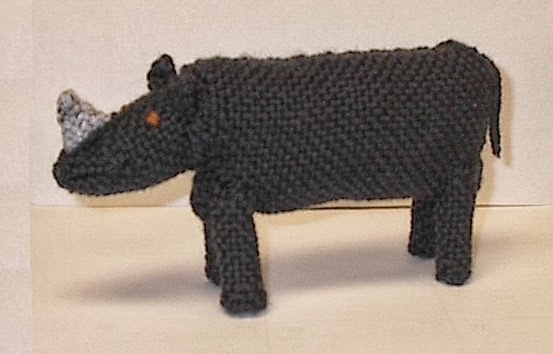 Here are a few more woven-from-pin-loom animals. All of these animals are made with three ingredients - woven yarn, chenille sticks for structure and stuffing. 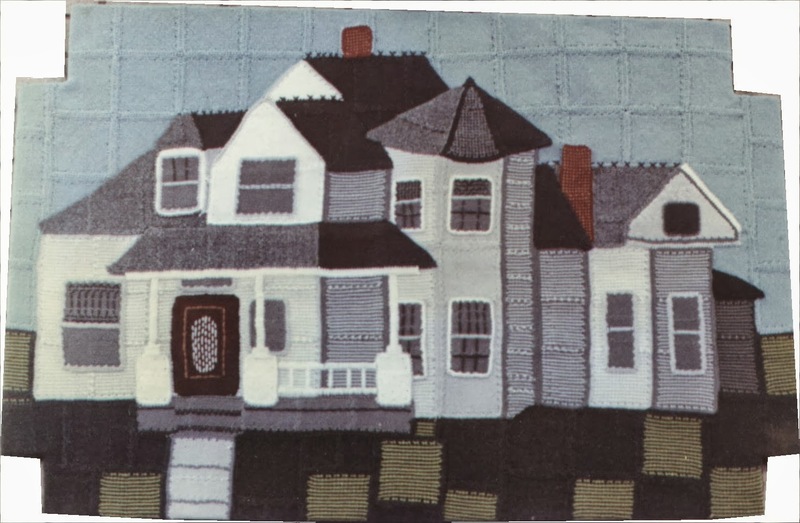 All are made with the product of the basic four pin looms, 2" x 2", 2" x 4", 4" x 4" and 4" x 6". I know that there are more sizes and there are projects out there where I will use the 6" x 6" loom or other sizes, but most of the time, the two small squares and two small rectangles are sufficient. This is my idea of what a mountain goat might look like. 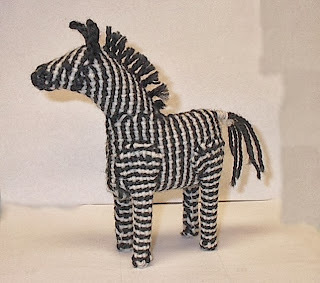 I am pretty sure that zebra stripes don't go in those directions, but people get the idea. 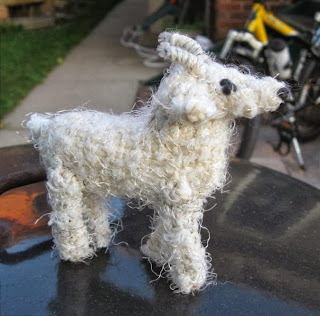 One of my challenges in weaving is to remember that it doesn't have to be perfect. After all, I'm doing it for the joy of it, so if I get into some sort of perfectionistic snit, I am defeating most of the purpose of weaving. The other purpose being to make some fun thing. 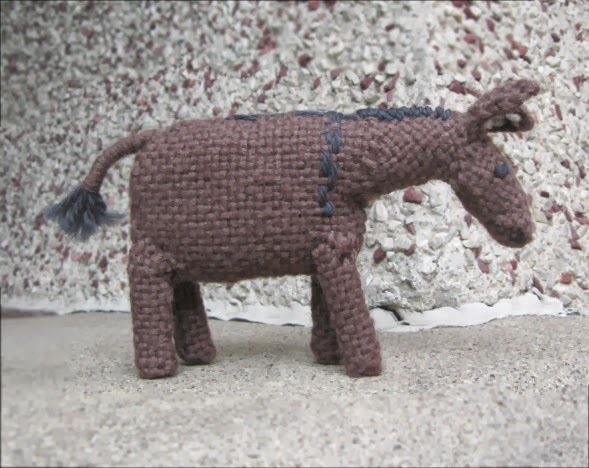 Having said that, I have to admit being very fond of the donkey because it seems to catch the donkey spirit. 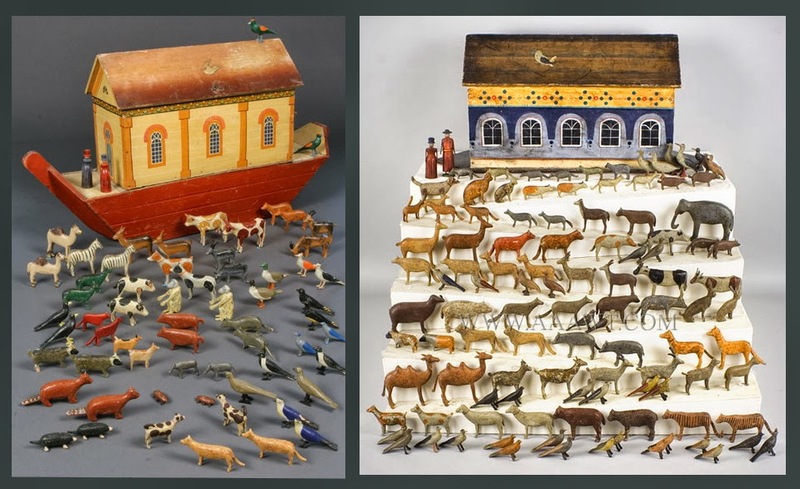 These are a few of the several pictures I've found of 19th century Noah's Ark sets. What an incredible amount of work and skill! 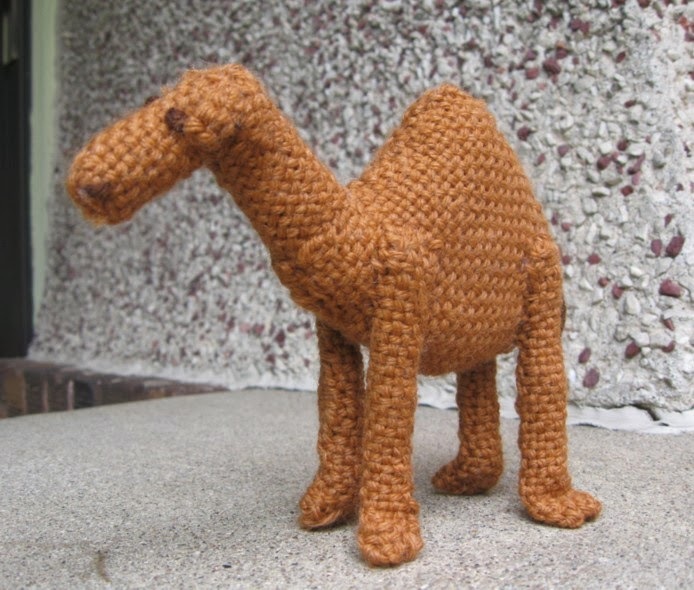 They were made at a time when Sunday was such a special day that children couldn't play with normal toys, but they could play with toys that represented a story from the Bible. The ark and animals that I am working on are all woven, but I hope that I can get a little of the same primitive and loving feeling to them. 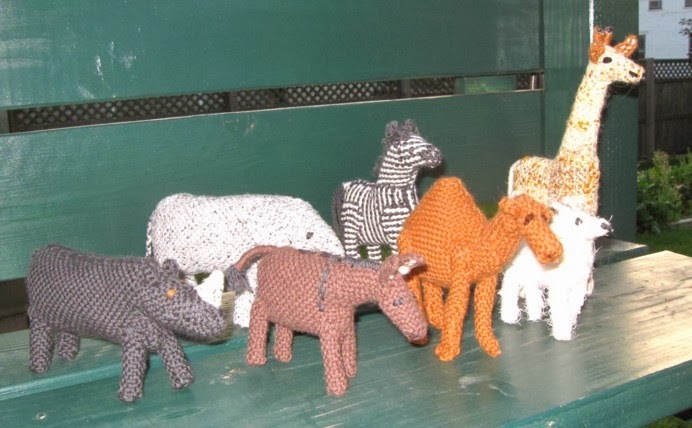 I'm afraid that the vast number of animals shown is part of what keeps pushing me to figure out how to weave more and different animals. This effort is now being joined by my friends and coworkers. I have had a coworker request some alpacas that will be made with alpaca yarn. Alpacas are amazingly goofy animals, I have never seen an animal that looks so much like a sock puppet. Next challenge, weaving an ark. Its interesting how their conception of the ark differs from today's toys. I'm thinking that the bridge, the house part, was painted to look like a mansion of the time. Knowing that we are living in a world where most people assume that yarn is just for crochet and knitting, I get a ridiculous thrill when I carry home those same yarns and produce, not stripes or lumps of one color, but a synthesis of shades that varies from square to square, sometimes with lovely matching overtones, sometimes in wild contrast. some experimental weavies that I am planning to make into a purse. I saw a lovely purse that was edged in leather with a tapestry insert that I would like to imitate in weavies. 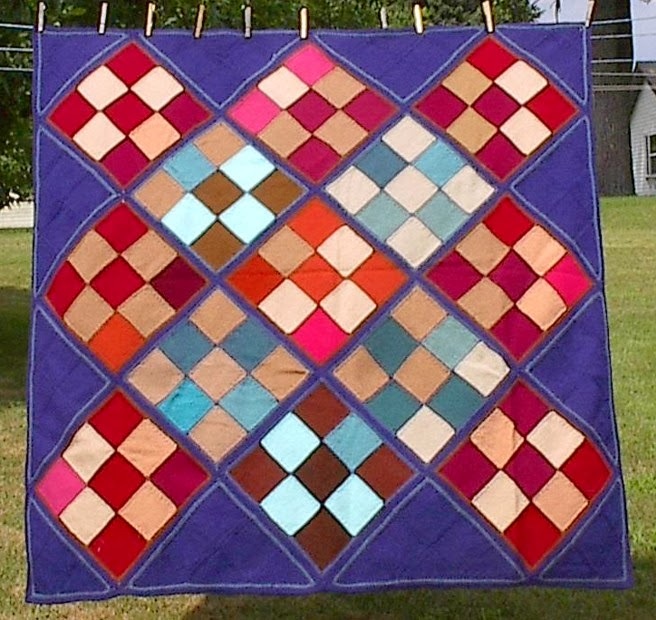 My plan is to weave the body out of the above squares, then probably use a suede-like light brown as edging. I will add a drawing and later, a picture of the purse. Right now I am just enjoying making and joining the weavies. Here is my confession right up front. 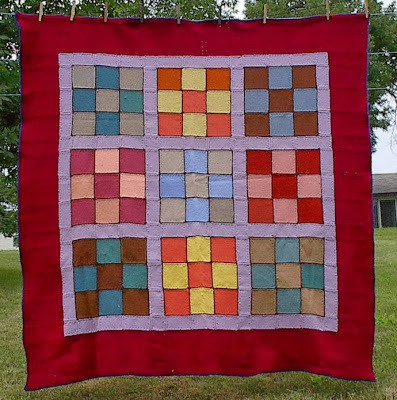 The reason that I have woven blankets and hangings and bowls and every possible thing that I could think of in little squares of woven fabric, a.k.a. "weavies", is that I LOVE weaving on pin looms. 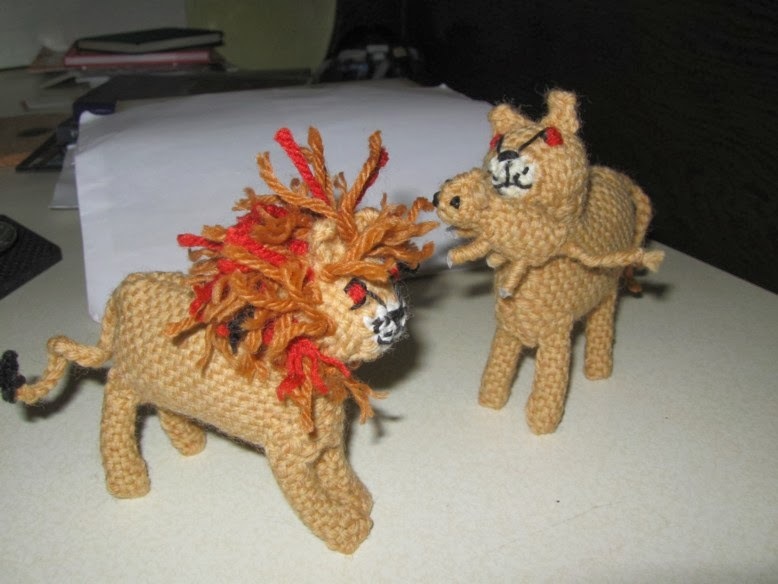 I believe that they represent the crack cocaine of weaving. Weavers all secretly (or not so secretly) know that weaving is addictive. It makes you feel good. It is calming and energizing at the same time. It gives voice to creativity and allows it a concrete, whole-body expression. 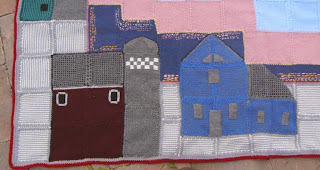 The downside of weaving is that it can take a lot of time and space. Pin looms are little. The most popular size is 4 inches by 4 inches. You get all the good feelings of weaving in an intense little package.The downside (or the upside, depending on how you look at it) is that you end up with lots of little squares. 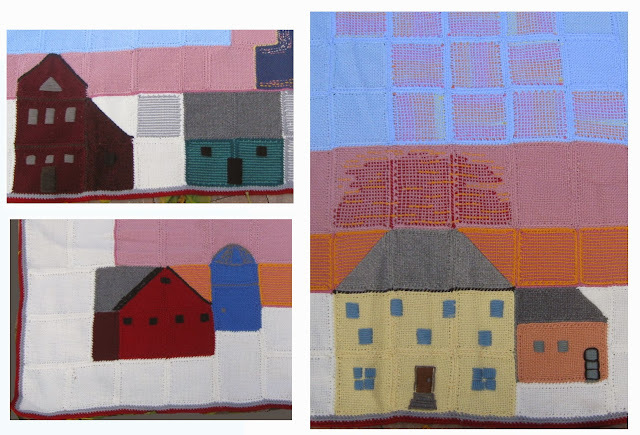 The projects shown below are all proof that I love weaving on pin looms. This was modeled after a house in Tucumcari, New Mexico. One of the things I love about designing with weavies is that it gives a wonderful primitive look that I like very much. The next several blankets owe their design to Amish quilts and, along with the house, were some of the earliest items I made. One of the challenges of using pin looms is joining them. 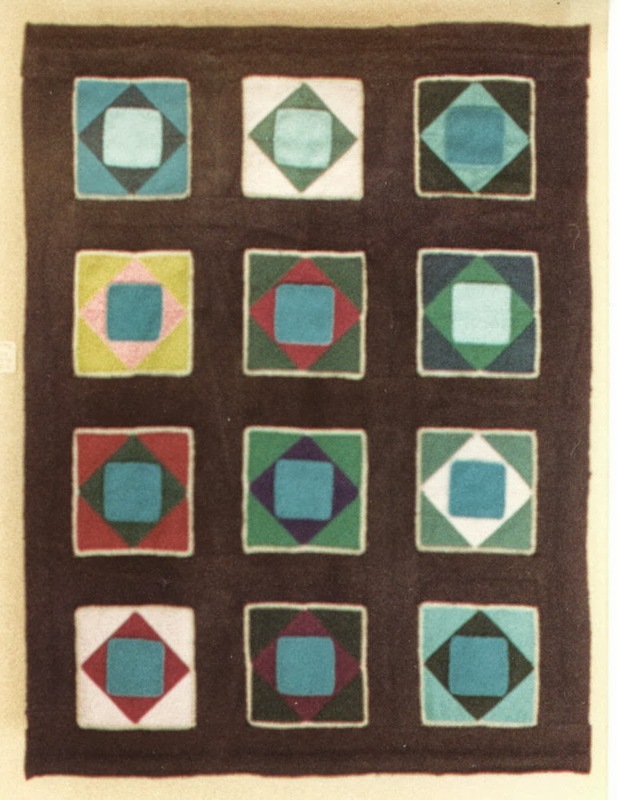 If you look in the instruction books from the 40's and 50's, you will see clothing and blankets where the weaver tried to join the squares so as to make it look like a larger piece of whole cloth. It never works. You can always see the join lines. 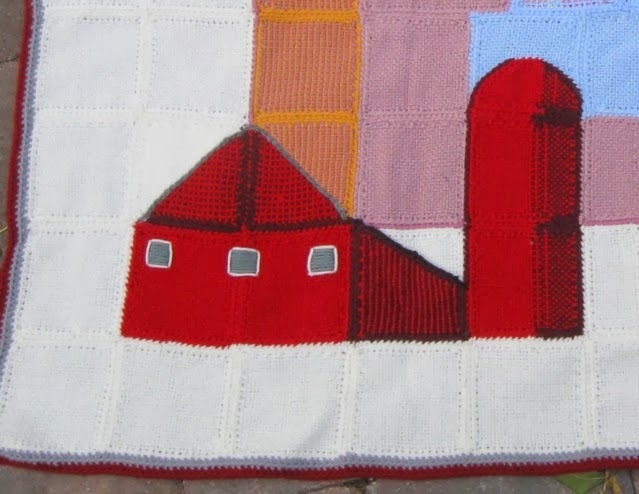 So I decided to highlight the the fact that these blankets are made from tiny pieces by incorporating colored patterns and using a joining approach that did not try to be seamless. 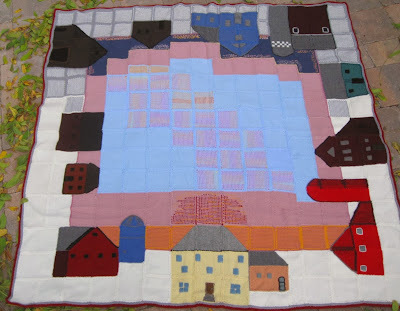 All of these pieces, except parts of the house, were joined by using a single crochet around each weavie and then whipstitching them together. This blanket was based on a postage stamp that celebrated Amish quilts. It did not take forever to make but at the time it felt like it was going to take forever. It was only after I finished this blanket that I thought, "wow, those edges would be a great place to use a bias loom." Since then I have made some smaller throws using weavies and bias loom weavies and it worked pretty well. We can talk more about the ups and downs of the bias loom later. I call it that because it took almost a whole winter to complete it and it is too large to be a afghan, its a real blanket. 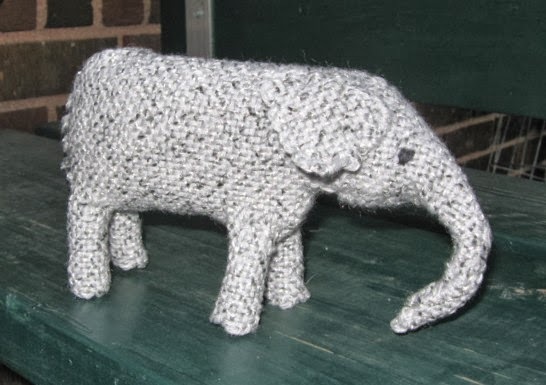 I recommend starting a project like this in the summer, that way by the time you are ready to start attaching all the pieces, its getting cold and you may actually want to hold it on your lap. This is a picture of a blanket made for the daughter of a family who had a connection to the Renaissance Fair. I wanted to make something slightly feminine but dragony. It was not an easy pattern to carry off. 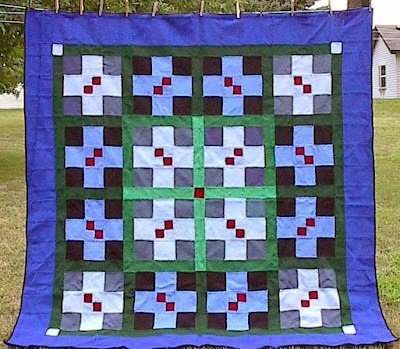 I finally accomplished it by making a full sized pattern and then just weaving squares and filling in the parts. 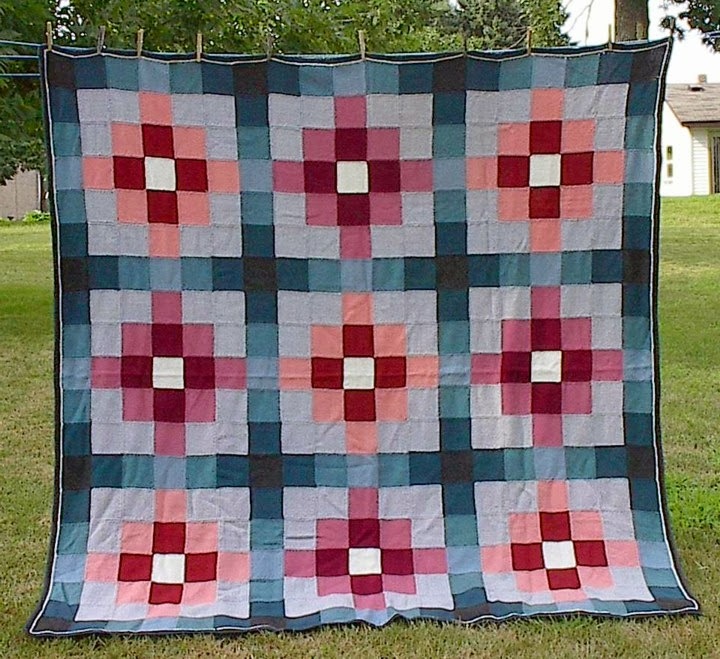 Making a blanket like this is such an adventure. I spend about a third of the time feeling lost, pretty certain that I'd taken on an impossible task. And then, somehow, it came together and was so much fun. And it looks great! Or at least as good, though different, than I originally saw it in my head.